Imagine putting out announcements and creating Pinterest-perfect Bulletin Boards and someone comes along to change it or the weather destroys your hard work. 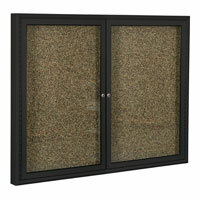 Rid yourself of that frustration and protect your time and investment by using locking Enclosed Bulletin Boards. Glass Enclosed Bulletin Boards with locks allow your message to come across crystal clear, while still keeping a firm �Hands Off� policy. Enclosed Bulletin Boards with removable letter panels make it easy for you to have neat and clear messages using Changeable Letters and Numbers. 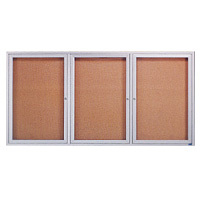 Having an Indoor or Outdoor Enclosed Bulletin Board is one of many ways your classroom or business can be Eco-Friendly. Outdoor Bulletin Boards in wood frames come in a Park Bulletin Board Series or traditional Enclosed Bulletin Boards for walls to display all of your bulletin board ideas. Pin away on Enclosed Bulletin Boards for an inexpensive advertising campaign and call us for details about Custom Enclosed Bulletin Boards at 1.800.791.2946! US Markerboard is a Whiteboard company. Our main offerings include: Porcelain Magnetic Whiteboards, Freestanding Whiteboards, Indoor Enclosed Bulletin Boards, and Outdoor Enclosed Bulletin Boards for schools, offices, hospitals and more.